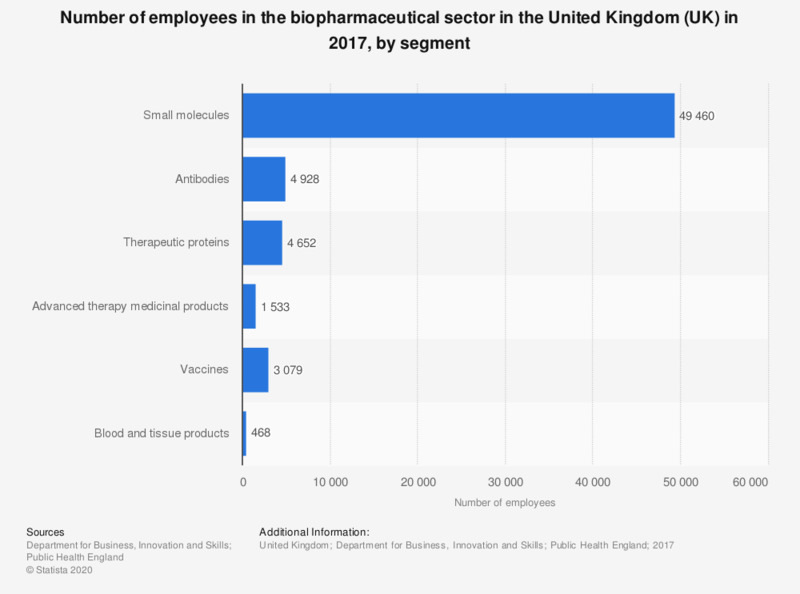 This statistic displays the number of employees in the biopharmaceutical sector in the United Kingdom (UK) in 2017, by segment. The biopharmaceutical sector researches and produces pharmaceutical medications which are extracted or semi-synthesized from a biological source. These can include vaccines, antibodies, blood and tissue products and therapeutic proteins. The biopharmaceutical sector with the largest number of employees in 2017 was small molecules at approximately 49.5 thousand employees. This was followed by antibodies at 4.9 thousand employees. The biopharmaceutical sector with the lowest number of employees was blood and tissue products at 468 employess.